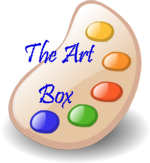 The Art Box – April 26, 2010 | Tired, Need Sleep. In the Art Box last week: stickers, stamps, stencils… plus all the usual paper, glue, paint, etc. Have some children’s art you’d like to show off? Link it up below (remember to link back here in your blog post)! Fun week. Your art boxes are always put together great. I really have to try stencils here. Love the stencil piece he made! The train turned out great!